The phrase “running for your life” may have many think of survival, but now it has taken on a slightly different meaning thanks to a study from the University of Iowa. The researchers of this study found that runners may live an average of three years longer—and you don’t have to be a Usain Bolt to enjoy the benefits of running! Going for a run at a slow speed could be enough to add years to your life. The extensive study followed 55,000 adults between the ages of 18 and 100 over the course of 15 years to determine the link between running and longevity. Approximately one quarter of the study’s subjects were runners. The subjects were asked to fill out a questionnaire with their running habits and the researchers kept track of the participants who passed away during the 15-year period. The researchers also took factors such as each participant’s health into account. The study found that the participants who ran regularly had a 30% lower risk of dying of any cause than the participants who didn’t run; the runners also had a 45% reduced risk of dying of heart disease and stroke. Running 30 to 59 minutes a day reduced their overall risk of death by up to 28% and their chances of dying from a heart attack or stroke by 58%. While the researchers weren’t able to conclusively determine whether running directly led to living a longer life, they were able to determine that there is a link between the two. Healthy people are typically the ones who take up running, and running, along with an improved diet, leads to better health. It’s currently recommended that individuals run up to 75 minutes a week, but exercising for 30 minutes three times a week has benefits as well. Even running for less than 51 minutes a week (or just under six miles at a rate of six miles an hour) still has its benefits. Individuals who worked out this much reported a significant improvement in physical health or maintained good health if they were running at this rate. However, taking up running can be a challenge as well. It requires commitment. The subjects who showed the best overall health were the ones who had been running for six or more years. The key to runners’ increased longevity appears to be the improvement in their heart and lung health. Running can also come with some downsides, such as the possibility of it leading to issues with the joints, ankle sprains and strains, pulled muscles, shin splints, and back pain. A compromise for those who don’t feel like running or who are unable to run due to existing health conditions may be going for long walks or starting out with walking and gradually working their way up to running. If knee troubles or back pain are of concern, you could also consider running on an elliptical. 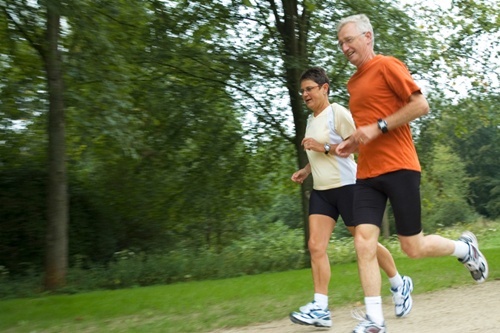 “Running Could Add 3 Years to Your Life Span,” MedlinePlus web site, July 28, 2014; http://www.nlm.nih.gov/medlineplus/news/fullstory_147543.html.